A complete copper alloy awl or leather working tool of uncertain date. The awl has a square-sectioned centre which tapers to a fine point at one end while the other end narrows into a flat chisel-like end. It is assumed that one of these ends would form a tang however either end would function well as a leather or possibly a woodworking tool. Most awls like this are dated to the Bronze Age however the form and function of awls changed little in 3000 years, therefore they could date to anywhere between the Bronze Age though to the medieval period. 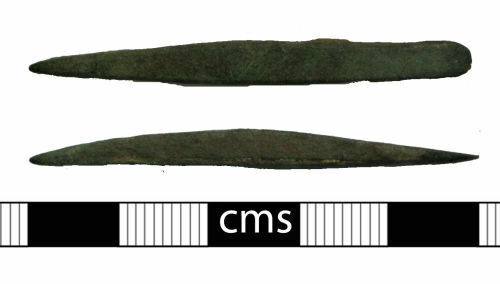 The patina on this example suggets a possible Roman or later date, however an earlier date cannot be ruled out; without contextual information these objects are very hard to date.